Tweedle Dee and Tweedle Dum are brothers whom Alice meets in Wonderland. They are very fond of rhyming words and spouting poetry. They also love playing games. They’re very excitable and noisy which makes them a tad bit annoying but they mean well. Tweedle Dee and Tweedle Dum are so eerily similar that they also wear identical, brightly colored clothes. They both have on bright yellow shirts with white collars and a light blue bow tie. They also pair it with bright red pants and a bright red cap with yellow propellers. 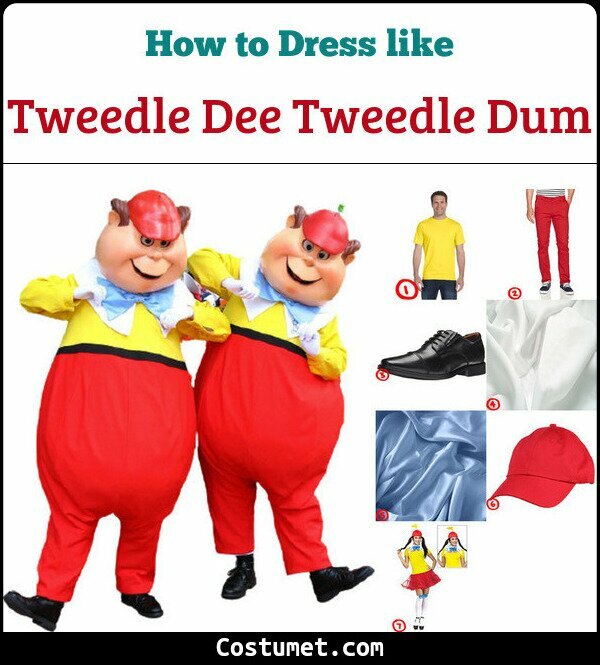 Here’s everything you need to look like Tweedle Dee and Tweedle Dum. 1 Plain Bright Yellow Tee Use this plain bright yellow t shirt as your main foundation for the Tweedles’ outfits. 2 Bright Red Pants Pair it with outrageously bright red pants to create a whimsical look. 3 Black Oxfords Since they are from a classical era of Disney, the Tweedles are still wearing classic black Oxfords. 4 White Cotton Fabric Use this white cotton fabric to create the Tweedles’ oversized collars. 5 Light Blue Satin Fabric Create giant bow ties to copy the Tweedles’ look. 6 Plain Red Cap Don on a plain red cap and add yellow mini-flags on top to create the Tweedles’ unqiue headgear. 6 Tweedle Twins Full Costume Set Get you and your bestie matching costumes with this Tweedle Twins full costume set. Tweedle Dee and Tweedle Dum were voiced by J. Pat O’Malley. O’Malley was a Disney legend, lending his voice to many characters from the Jungle Book, Mary Poppins, 101 Dalmatians, and many more. Jake wears a casual rendition of a pirate captain’s uniform while Izzy prefers a more comfortable and modern look.